I've never read the Valerian and Laureline comic series. I had heard about it and seen images of the series but never actually knew too much about it. What I had heard was it was a French series with space spies in the future which is appealing but wasn't enough for me to search for a translated edition to check out. 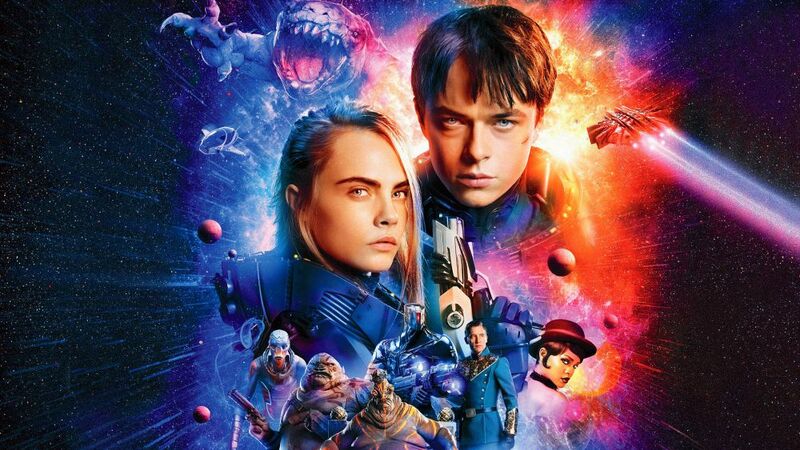 So, when I saw Valerian and the City of a Thousand Planets all I knew was I was going to see a Luc Besson movie with cool special effects and probably an epic chase scene. I was correct. It was also better than I thought it would be and maybe that was because I don't know the source material so I went in with limited to no expectations. The movie is about a team of space military police who live in a future where humanity has encountered alien races and has transformed the International Space Station into Alpha, the City of a Thousand Planets in the title. The sequence of how we get from our Earth orbiting station to this is brilliant and demonstrates what this movie is about and looks like. Even if you don't watch the entire movie please watch this opening scene. Our duo is pretty straight forward and the introduction to them is immediate. Their characters are built up more as the movie progresses but the basics are right there to start. Valerian is a competent soldier and a bit of a spy who thinks outside of the box to get things accomplished while his partner Laureline is mission oriented and attacks the problems they encounter in the most direct way. Laureline is the serious balance to Valerian's rougish nature. They are also lovers trying to figure out their relationship and future, if they have any. The main plot points of the story revolves around a mission where the duo has to retrieve a device/animal called a Mul converter, that can replicate anything it consumes, and a dream that Valerian has about the destruction of a peaceful race that used animals to replicate materials for their society. I think the androgyny of this race was more than a visual choice. This is very much a Luc Besson movie. The imagery is amazing and one of the protagonist is a powerful or strange woman, like in La Femme Nikita, The Fifth Element and Lucy. He takes it a step further in this but I won't say more than that. The movie is gorgeous to look at. It is obviously a labor of love with Besson financing a great deal of the production personally. It shows. The alien races are varied, even the small moments of evocative of his prior work and design and Rihanna's character of Bubble, the shapeshifting alien, is amazing. She isn't a major character but she plays a pivotal role in the rescue contest between Laureline and Valerian. Her transformation scene is brilliantly shot and the special effects are seamless in it. Plus, it's Rihanna and we can always use a little more Rihanna in our life. This film may not have been as critically acclaimed as it should have been and there may have been issues with it, particularly if you are familiar with the source material and maybe the divergence from it. I enjoyed and think it would make a good nerdy date movie. Your mileage, of course, may vary but it is definitely worth a viewing if for the visuals alone.